A tax credit is a dollar for dollar credit against your tax, not against your income. So, if your taxable income was $50,000, the 10% tax again means a tax of $5,000. The $1,000 credit reduces the tax itself to $4,000. Conclusion: a credit gives more oomph to your bottom line than a deduction. Finding a credit that works for you can be tricky. If you have children, then make sure you investigate the Child Tax Credit and the Child and Dependent Care Credit. If you work, and your income is below a certain level, you may be eligible for the Earned Income Tax Credit. If you go to school, there are some education credits available as well. Those are some of the more popular federal tax credits. Take a look here at the IRS site for more credits that you may be eligible for. One area that is overlooked are state tax credits. 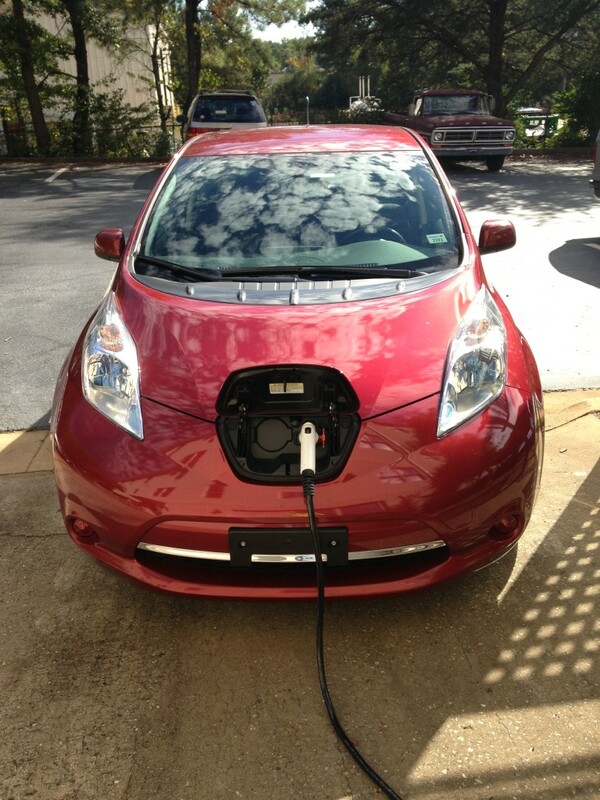 In fact, the electric car in this picture is owned by one of the CPAs I work with in order to take advantage of a state tax credit here in Georgia. Many states have some sort of alternative fuel tax credit available. Georgia’s is particularly nice because the credit can be for the purchase or the lease of an electric car. The credit amount is high enough so that it offsets the price of the lease. Free vehicle…cool! In addition, there is no expense for gas, and just a minimal expense for the electricity to charge the vehicle – an estimated $1 for every 25 miles. There is also the side benefit of it being a cleaner running engine which is beneficial to the environment. Of course, there is still the need for vehicle insurance and trips need to be planned out since the vehicle can only go about 90 miles on a charge. But for many people this can work out to be a good option for a commuting car. To find tax credits for your state, I would do a Google search for [your state] and “tax credits”. Make sure you are looking for individual credits, not corporate tax credits. What good tax credits are available in your state? What about leasing — would you lease a vehicle if you were going to get a tax credit to cover the payments? Author Bio: My name is Kim and I’m a licensed CPA in the state of Georgia. I work at Loggins, Kern & McCombs, CPAs. If you have a tax question that you would like to submit, please click here and send it to me. Whatever advice I give, please remember to consult with your own tax professional as issues vary depending on your situation. I’m not sure whether we have a tax credit for electric cars in Indiana, But, we do get a 20% tax credit on the first $5,000 we put in our kid’s college fund. Wow, that’s a pretty good one. There are so many other tax benefits surrounding higher education, too. Wow that is awesome! Definitely have to look up tax credits in Pennsylvania! I don’t qualify for that many tax credits, but when I was in college I remember getting a sizable one. I would absolutely get a leased car if the tax credit covered the cost of the lease. This may not be a bad thing to look into in Minnesota, though I understand you are referencing Georgia in this post. While I think a flat tax on income would be more desirable, it excites me that there are ways to take advantage of the tax code where you can get a free leased car. You’d be crazy not to take advantage of this if you live in Georgia. It does work out to be pretty nice. In addition, my boss has put in a charging station here at work, and I believe he got a business tax credit for that as well. Those charging stations can charge up the car in about 3 hours (as opposed to about 8 hours if plugged in a normal wall outlet). And, I’m all in favor of simplifying the tax code. Even though my livelihood is based on people coming to me for help, I think our current tax code is ridiculous. There’s so much planning to be done around taxes that can really save you a lot of money. Honestly, I think it’s unfortunate because I think it adds a lot more waste to our society than value, but it is what it is. We definitely take advantage of the child tax credit, and we also have a commuting deduction in our state that I use. Beyond that we don’t qualify for too much though. Do you mean that the tax planning adds waste instead of value? I completely agree — the amount of time spent learning about and complying with the tax code is incredible. However, with the system that we have now, tax planning is time well spent. I always have to laugh a little — on most IRS forms, there is something called the Paperwork Reduction Act Notice, or something like that. More paperwork to tell you about the reduction in paperwork. HA. Anyway, they always have an estimate on the amount of time that that particular form will take you to fill out, and it is usually a crazy amount of time. For example, the amount of time spent preparing a 1120S (a tax return for an S-Corporation, which is by definition, a small business), is 56 hours. Yes, you summed up what I meant correctly. Given the current environment and the laws we have, tax planning adds a lot of value. But looking at the whole, the fact that we have all of these complicated tax laws that requires tax planning is a waste of resources.